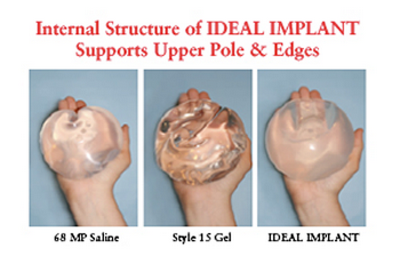 Thoughs on the Ideal silicone / saline breast implant. The 2 main types of breast implants available for decades have been the saline filled an silicone gel filled breast implants. Each has its pros and cons. Silicone gel implants have a more natural feel and look. 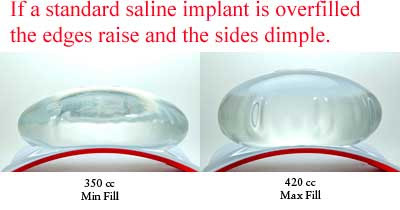 Unlike silicone gel, implants containing only saline do not blend well with surrounding tissues at the edges of the implants. This is due to the chemical properties of salt water which is chemically charged as positive and negative charges that attract each other as opposed to silicone gel which does not carry a charge. Thus saline is more cohesive than silicone. What this means in clinical terms is that saline implant margins are more visible than silicone gel implant margins, especially when the soft tissue (breast gland and fat) between the outside world and the implant is thinner. Thus, in those patients with smaller breasts (less glandular tissue and/or fat) it is preferable to place saline implants under the chest muscle. Saline implants may look very good when lying flat on a table. However, when upright the upper portion of the implant collapses (wrinkles or ripples) as the cohesive saline falls to the bottom of the implant and cannot support the upper part of the underinflated implant. If this underinflated implant is placed on top of the muscle in a thin individual with small breasts the collapsed upper part of the implant can be very unsightly. The collapsed edges appear as rippling when viewed from outside the body. The rippling becomes more apparent after the postoperative swelling resolves and the pocket around the implant shrinks to meet the dimensions of the implant. When placed submuscularly the rippling is more apparent to the side of the chest wall and lower chest, where there is no muscle, and when leaning forward because this positions the implant closer to the surface. Overfilling a saline implant (above the amount listed on the box) on the other hand can also be unsightly & doesn't necessarily prevent the appearance of wrippling. Overfilling produces a hard breast which most patients seem to like less than rippling. Despite this some patients prefer saline because they are worried about leakage of silicone gel. Since the saline implants are inflated after placement they can be inserted through a much smaller incision than silicone gel implants and can be fine tuned for size and breast symmetry as they do not come pre-filled. For years double lumen implants of saline and silicone gel were available in attempt to have a breast implant that was the best of both worlds. The implants had an adjustable saline bag inside a silicone bag. They were available in 50/50, 25/75 and 35/65 percentage ratios of silicone gel to saline. I have recently been informed by the manufacturers that they no longer make this type of implant. In 2006 a new saline implant was designed to improve the results obtainable with saline implants. 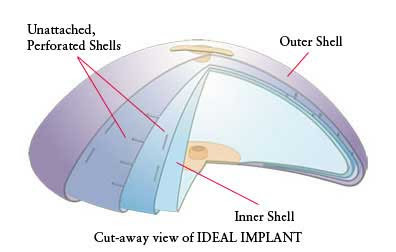 It is called the Ideal Implant and contains an inner shell defining an inner saline compartment and an outer shell defining an outer saline compartment; between these shells are one to three unattached, perforated shells. This internal structure was designed for control of saline movement to reduce bouncing, and for support of the implant edges to minimize wrinkling and prevent collapse of the upper portion of the implant. In the photo below you can see less collapse of the upper half of the Ideal Implant when it is upright. The edges of the implant were also lowered so it may contour better to the chest wall. FDA clinical trials were then begun and closed to new patients in 2010. The studies will last 10 years but the 2 year results have just been released and are favorable. Two-year follow-up visits were completed by 472 of the 502 women enrolled at 35 private practices. Of these, 378 had undergone primary breast augmentation and 94 had received replacement augmentation. Patient-reported satisfaction with the outcome was 94.3% for primary augmentations and 92.3% for replacement augmentations. Moreover, surgeon-reported satisfaction was also high (96.5% and 93.4%, respectively). The incidence of moderate-to-severe wrinkling was 3.8% (primary) and 12.0% (replacement). Baker Grade III and IV capsular contracture rates were 3.8% (primary) and 8.2% (replacement). These 2-year rates are lower than those reported for current standard single-lumen saline implants at 1 year. It will still be a number of years before these are available to the general public but it looks promising so far.